Mike: I don’t know if I told you this but at the last Pro Tour I was kind of sort of cheering for PV over Jon in that Top 8 match because I just wanted to see Mono-Red win another Pro Tour consecutively. Patrick: I’m totally telling Jon that. Mike: Oh I told Jon. Are you kidding? Another format, another super successful Mono-Red (or R/g) aggro deck! 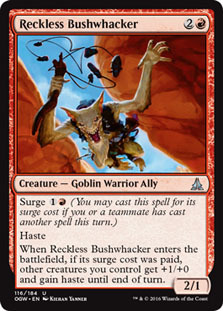 Korey’s deck starts as a Red Aggro deck that essentially swaps out Temur Battle Rage for the brand new Reckless Bushwhacker. This makes his Red Aggro deck less of a combo kill-oriented deck and more one that builds on the advantages of going wide with Dragon Fodder or Hordeling Outburst. Consider how much damage (and haste) Korey can generate with, say, “just” a turn three Hordeling Outburst followed by a Dragon Fodder + Surge’d Reckless Bushwhacker! 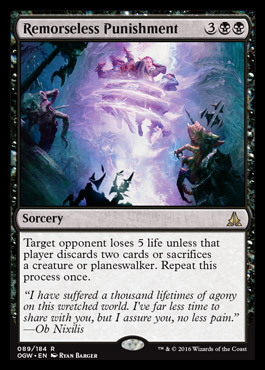 With haste, that’s more than half of the opponent’s life total. Korey’s sideboard is quite inventive, a semi-transformational sideboard. In Game One this is a Red Aggro deck. In fact it is exactly the kind of deck that opponents will side Arashin Cleric in against. But that kind of sideboarding could be disastrous against Korey! After sideboarding Korey adds more mana — black mana actually — that allows him to not only add black advantage cards like Painful Truths and Self-Inflicted Wound; but more lands in general, allowing him to go slightly more expensive with cards like Pia and Kiran Nalaar. 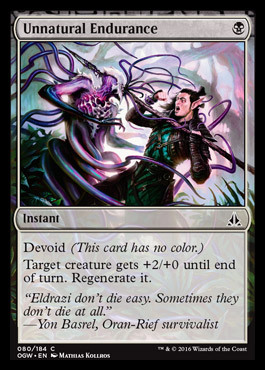 His opponents may be aiming for a fast combo-kill deck… When in fact they are facing a Jund Midrange deck after sideboarding. What’s really cool about this sideboard is how Painful Truths can allow it to keep pace with the card advantage of, say, an Esper Dragons deck; while Self-Inflicted Wound (coming in over, say, Fiery Impulse) can give it easy ways to take out Dragonlord Ojutai. All-in-all… Sweet deck, and also sweet to see Oath of the Gatewatch making such a swift waves! Over the course of “Reckless Bushwhacker – Immediate Impact” Patrick and Michael discuss all the Top 8 decks from the Atlanta Open, as well as four different archetypes (including, not surprisingly, Red Aggro) that outperformed the rest of the field. What are they? In this episode of Top Level Podcast, Mike (Resident Genius Michael J. Flores) and Patrick (Pro Tour Champion and Pro Tour Hall of Famer Patrick Chapin) shake up the usual format… Mike asks Patrick about some new cards from the new set and Patrick tells him what he thinks! Oath of Chandra is one of the centerpiece cards in this podcast. Arguably the weakest of the Oath of the Gatewatch namesakes, Oath of Chandra still has some interesting applications as a Constructed playable spell; possibly as a Role Player; possibly (as Mike suggests) as a sideboard card a la Volcanic Hammer in Patrick’s Regional Championships Korlash deck from close to a decade ago. Oath of Chandra is kind of a more restrictive Volcanic Hammer on its face. Like Volcanic Hammer, it can deal three damage to a creature for two mana… But unlike Volcanic Hammer, it can’t (immediately) be pointed straight at the opponent’s dome. Because of this, if you get even one Planeswalker trigger, Oath of Chandra moves from a kind of bad (but possibly still applicable) Volcanic Hammer to Searing Blood range. Like Searing Blood this card will now deal five damage over one creature and one player for two mana, making it pretty good on rate. If you get any additional triggers from Oath of Chandra (i.e. 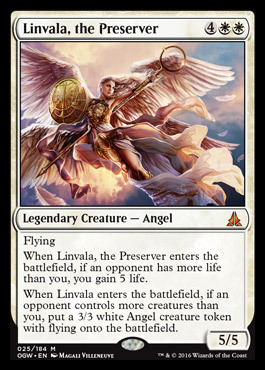 from any future Planeswalker triggers) the rate payback on that two mana only gets better and better. 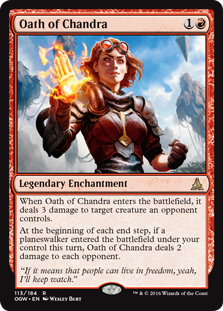 Like the other Oaths we’ve discussed, Oath of Chandra is a Legendary Enchantment, so a second copy hitting the battlefield will put one into the graveyard. But that may or may not be a strict disadvantage given a pretty cool interaction Patrick points out in this podcast. You’ll have to listen to “Oath of Chandra and Five Friends” to find out! Oath of Nissa Bonus Episode! … But Top Level Podcast is still Still STILL here for our regularly-scheduled Thursday episode! What do you think about Oath of Nissa? Oath of Nissa is at least “two different cards” … It incorporates both a card selection ability and a longer-term mana fixing one. First and foremost, this is a card that will affect deck design and mulligan decisions. Playing with Oath of Nissa may impact how many lands you play in your deck; certainly it will increase your chances of hitting your second land when you keep a one-land hand featuring Oath of Nissa. Note: Oath of Nissa actually digs you four cards deep for purposes of drawing a second land. Not only do you get to look at the top three cards of your library (where you are a favorite to see a land), your actual next draw is the fourth card (not the first, which you’ve already seen), dramatically increasing your chances. When you just put Oath of Nissa in your Abzan deck, you are just going to draw so many more Siege Rhinos and Den Protectors! And because Oath of Nissa is a Legendary Enchantment (meaning if you play a second one, one of them will go to the graveyard) it makes it easier to re-buy with Den Protector! The second ability on Oath of Nissa isn’t as important as the card-replacing first… But it can still be relevant. 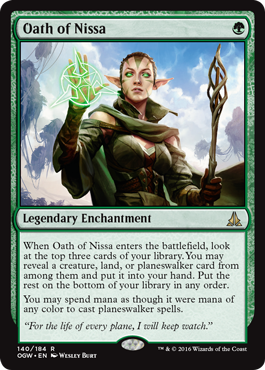 Oath of Nissa can help your green deck hit the WW on Gideon more quickly and consistently, or make Sarkhan, Unbroken more palatable. 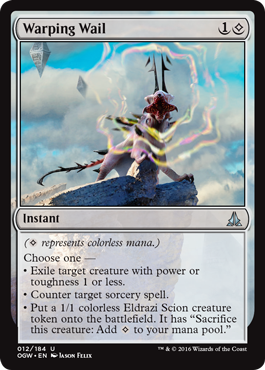 Warping Wail is an exciting card that will be sure to find play in Standard and larger formats. As a card with three, disparate, and slightly more-expensive-than-expected abilities, Warping Wail seems like a generalist; that is, it seems like a card that you play for its versatility more than any of its particular abilities. Warping Wail is a bit of a surgeon, not just a generalist. Imagine a Modern (or Legacy) Merfolk deck with both Cavern of Souls and Mutavault (lands that are effective in-theme in a tribal deck but generally tap for colorless mana)… Warping Wail would be a great card in a Merfolk deck! Because it is colorless it is (duh) not blue… Most or all of the creatures in a Merfolk deck, however, are blue. How is a mostly- or mono-blue deck supposed to handle a Goblin Piledriver? All of a sudden Warping Wail starts looking really interesting, right? Goblin Piledriver has only one power (before it starts having lots and lots of power), so the not-blue (colorless) Warping Wail can target it. 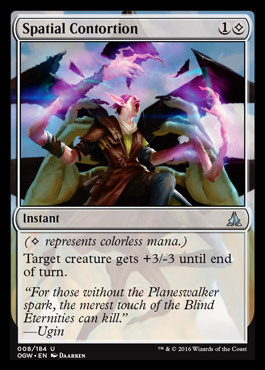 You might not want to play Warping Wail just for the “Exile target creature with power or toughness 1 or less” ability, but in the context of a card that does two other interesting things, your generalist just became a Goblin Piledriver-assassinating surgeon! Resident Genius Michael J. Flores and Pro Tour Champion Patrick Chapin spend this entire podcast spit balling other relevant uses for Warping Wail, from sniping mana accelerators to taking out premium-haste-threat-to-be Eldrazi Obligator… And there are two other abilities! Love Top Level Podcast? Want to hear more from these guys? Jori En, Ruin Diver has got to be one of the top cards in Oath of the Gatewatch! It can be splashed in a Red Deck, giving card advantage fuel to a color that doesn’t often have it. It might be one of the cards that brings Grixis back to Standard in a legitimate way. Blue and red have got some good trigger cards… But one mana for Duress, Murderous Cut, or even Tasigur, the Golden Fang are all hot. Did we say “Tasigur, the Golden Fang”? We did! Jori En, Ruin Diver can in a way be stronger on “four” mana that Bloodbraid Elf. It is similar in size but when combined with Delve, can break some rules of expectation. 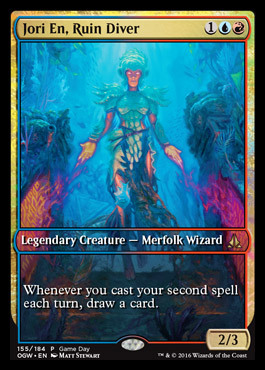 Jori En, Ruin Diver’s most common play pattern will be on four mana, leaving up a mana for cards like Wild Slash or possibly Dispel to protect the Merfolk Wizard post-resolution. That means that this 2/3 can get paid off the turn it hits the battlefield (unlike a similarly-costed Scroll Thief or Ophidian). Once you’ve untapped, Jori En, Ruin Diver can net card advantage on both your turn and your opponent’s turn! The theme of Oath of the Gatewatch almost seems like “paying players off for choosing cheap spells” … One and two mana spells tend to give players the highest returns but they really do with Jori En, Ruin Diver and the various members of the Surge squad. Jori En, Ruin Diver doesn’t have built-in protection (no Hexproof or whatever)… But it is chock full of resilience, at least for its cost. And because it has three toughness, it is too big for a Wild Slash (or the front half of Kozilek’s Return)! While Jori En, Ruin Diver isn’t quite Geist of the St. Traft, it is pretty tough for a tiny ‘Tome. Spacial Contortion is even better and more important than it looks! Mike thought Spacial Contortion would be mostly be a card for green decks, but everything from Mage-Ring Network to Haven of the Spirit Dragon can make it a tool for U/W! Here’s the crazy thing: Because of Wastes being a basic land, Evolving Wilds, Explosive Vegetation, and the like can let you Thaw for your Spacial Contortion setup land! This might be a card that re-writes some of the rules of mana balance and deck design. Jori En, Ruin Diver; Spacial Contortion; and tons more from Oath of the Gatewatch in this week’s episode!